Home > Kayaking in Halong Bay > Kayaking in Halong Bay: Things to know before you go! Kayaking in Halong Bay: Things to know before you go! 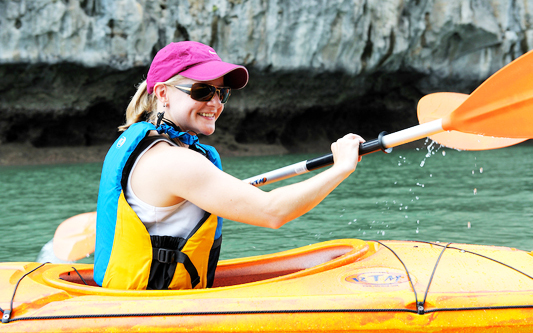 Kayaking in Halong Bay is the best way to explore the breathtaking beauty of Halong Bay. Paddle through islets; visit hidden caves, lagoons, unspoiled beaches and floating fishing villages…Kayaks go where other big boats cannot. Depending on trip length, visitors have different kayak route and time frame. 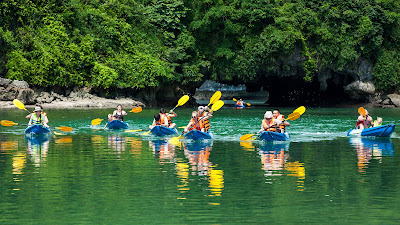 Cruise with Vietnam Typical Tours, paddling around the islands, get closer to limestone karst and enjoy the breathtaking nature in a less visited corner of Bai Tu Long Bay must be a great experience for life. Thanks to the bay’s thousands of islands the conditions for sea kayaking are ideal – the water is calm, the current is fine and the wind is not too strong. However, prevention is better than cure, it's advisable to learn by heart these following information for beginners. Kayaks can typically hold one to three paddlers. Depending on the type of material, prices for the vessels can vary greatly.Built for specific environments, there are a variety of these boats available: whitewater kayaks, surf kayaks, racing kayaks, sea or touring kayaks, and hybrids, often labeled as recreational kayaks. The design for the different kayaks vary with shape and materials used. Sea kayaks typically have longer bodies so they can cover more distance while whitewater kayaks are made of high-impact plastic so they can bounce off rocks while incurring less damage. 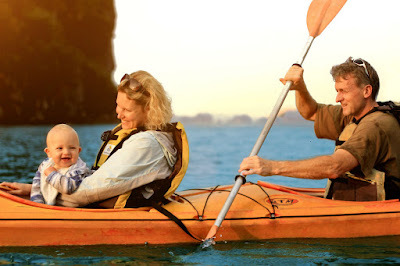 Sit-on-top kayaks are the most commonly sold and ideal for beginners because they are stable, easy to get in and out of, and used for recreational paddling and fishing. There is a lot of consideration when choosing a paddle, depending on your stature, size of the kayak, and stroking preferences. Wider and taller kayaks require longer paddles. If you have a small stature, a shorter, lighter paddle might be more ideal to not overexert yourself. In addition, blades come in a variety of shapes. Wider blades give you more acceleration but also face more resistance. Narrower blades use less effort per stroke but require more strokes. Blades also come flat or curved. While flat blades are generally cheaper, curved ones increase the power of each stroke. Some blades are feathered, meaning they're offset at an angle, cutting down on wind resistance. Like with a kayak, finding the right paddle requires trying out different types. To begin paddling, rest comfortably on the seat, keeping the boat stable. Grip onto the paddle with hands over and thumbs under. In general, you should have a relaxed grip on the paddle. The torso is your source of power, so you should be winding it to help you stroke, preventing strain of your arms, back, and shoulders. A basic forward stroke requires you stroke deeply and evenly. You begin by winding your torso, placing the blade parallel to the foot. The paddle comes out of the water when your hand reaches your hip, and you unwind your torso, repeating the process on the other side. There are several ways to turn. The most basic is to use the paddle as a rudder and drag it close to the kayak. The boat turns toward the same side of the blade. However, this technique loses a lot of forward momentum. To keep that momentum while turning, a sweep stroke is effective. You alternate the forward stroke on one side with a sweep stroke on the other. You sweep the paddle wide on one side of the kayak until it touches the stern, or the back of the boat. Continuing this pattern creates a wide arc turn. Now, everything's all ready, it's time for you to pack your bags and give your work a rain check. Don't hesitate to find suitable choice in our Halong Bay cruise catalogue because each cruise will bring you its own surprise. Trekking in Sapa becomes easier than ever! A must-see beach on Halong Bay! Are you looking for a homestay for your trekking?